1. People get crazy. I mean, really crazy. The stores start to go bare and people buy ridiculous things. Want to know what my Husband decided he needed to buy before Sandy shows her face? A cable for his ELECTRONIC music equipment. Priorities, I tell ya. The craziness runs rampant here in Central New Jersey. People pretend that we haven’t gone through things like this almost every year. The Garden State gets all 4 seasons and all natural disasters. But we’ll talk about that later. 2. All the ice pops must go! Notice I said ice pops instead of ice cream? Ice pops melt and that’s the end of that. If ice cream melts, it can be re-frozen, or used as an anglaise for doughnuts or cookies. Very fancy. Those ice pops need to be eaten before they can cause trouble. My kids and I are always up to that challenge, especially since I make homemade ones. I’ll miss them, but they’ll be with me…in my belly. 3. A multi-day game of flashlight tag! We take it back old school summer camp style and play laser tag. We also do shadow puppets, and turn on the radio and have my son do a shadow dance routine. Dance, monkey, dance! 4. There’s a weather lesson to be learned. As a surprise to anyone that doesn’t live here, New Jersey actually gets most of the natural disasters. We’ve had quite a few hurricanes, and even more Tornados! We even had an earthquake last year. Add in the fact that we get blizzards like clockwork every February and you have an opportunity to teach your children about weather first hand. I still remember when a tornado when down my parents street and I stood at the window to watch it split a tree in half. There were no flying cows though, but it would have been a possibility if we lived further down the state. I’ve already got a lesson plan ready for my Sonny, and it includes a poncho. 5. The cooking becomes epic. In anticipation of losing power, I tend to come up with interesting recipes and inventive ways to use leftovers that may go bad. Some of my most popular recipes on here have come out of power outages, or natural disasters. This also means making lots of snacks. I love snacks. 6. The Husband gets MAJOR overtime. And to be honest, I have the possibility to do the same. If we choose to, we can make “bank” during natural disasters since we both work for the state. Hubs tends to win out and gets to go to work, since his overtime is always worth more than mine. Also, I like being with the kids during big weather issues. It’s that Mom guilt thing. These are the times we make extra money for Christmas gifts and holiday travel. 7. My stockpile comes in handy. While everyone is off looting buying up essentials like wine, cheetos, and hot water heaters (say what? ), I don’t have to do a thing. We have a stockpile of everything, even batteries. The one thing we don’t have a stockpile of? Patience. It tends to run out after a while, and it’s so hard to get it back. 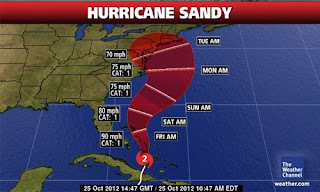 So, I say this with an open heart: Sandy, be nice! If you are in the line of Hurricane Sandy, please be safe!